Rajiv Gandhi International Cricket Stadium in Dehradun (also call Dehradun International Stadium) is a multi-purpose stadium in Dehradun a capital city of Uttarakhand. 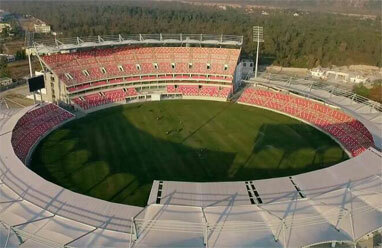 It is the first international level stadium in the state. On 3 June 2018, BCCI host first international cricket match between Afghanistan and Bangladesh on this Ground. Board of Control for Cricket in India (BCCI) had recognized it as a test centre and hosting its first ever test match match from 15 March between Afghanistan and Ireland. It was the 25th test venue in India.